The Top N feature allows you to display only a limited number of values that correspond to the highest or lowest values of a particular parameter. 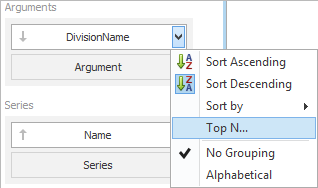 To display the top values in a dimension, select Top N from the data item menu. In the Top N Values dialog, check the Enabled check box and specify the following settings. Mode Specifies whether top or bottom values should be displayed. Count The number of values to be displayed. Measure The parameter according to which the top or bottom values will be determined. Show "Others" value If enabled, all values that are not the top/bottom ones are consolidated in the "Others" value. You can use the hidden measure as a parameter according to which the top or bottom values will be determined. See Hidden data items. Top N - InLoox • Copyright 1999-2019 © InLoox, Inc. All rights reserved.